Which is not to say that I don’t like the app. In fact, it turns out to be rather excellent. Instant costs a mere two dollars, and is worth every cent. 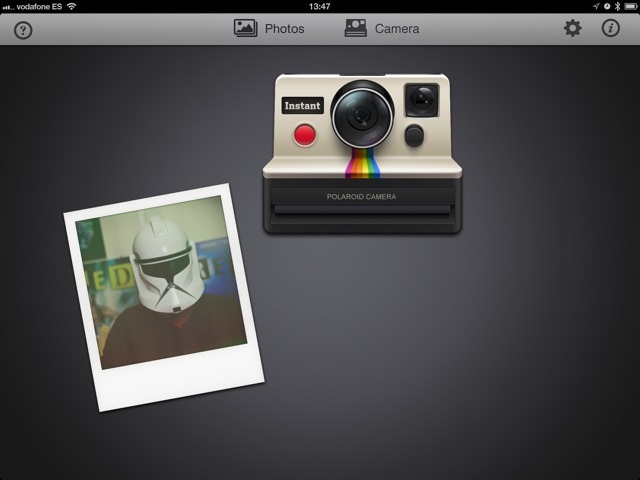 You can snap pictures from the iPad’s camera, or process photos from your library. The on-screen camera spits out the result, and a double-tap takes you to the editing screen where you can choose from 30 different effects (including expired versions of real Polaroid films). You can also adjust the intensity of the effects and other parameters. But it’s the interface that makes the app. You can drag your processed photos to any spot on the screen, and spin them around if you like. And you can move the on-screen camera, too. This makes the whole thing feel like a table with your camera and photos scattered on top. Beware: I had some trouble with photos imported from an actual camera: the aspect ratio was all off and the pictures got a little stretched. Pictures taken with the iPad are fine, though. And finally, here’s an excellent suggestion from The Lady. She said I should use the app to take photos of the Impossible Project store here in Barcelona, then post them to Instagram.